Neurons in the brain’s master clock that adjust their activity in response to light have a key role in the resetting of an animal’s daily cycle, finds a study of male and female mice published in JNeurosci. These cells may be responsible for circadian rhythm disruptions stemming from exposure to artificial light at night. 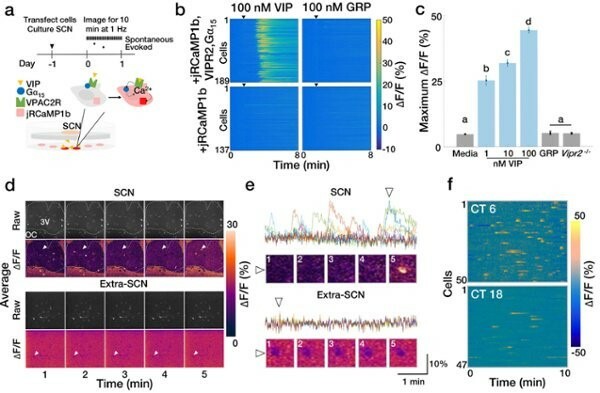 By demonstrating in mice that suprachiasmatic nucleus (SCN) neurons expressing the neuropeptide vasoactive intestinal peptide (VIP) exhibit a regular cycle in their activity levels that is disrupted under conditions of constant light, Erik Herzog and colleagues resolve long-standing questions about how the SCN synchronizes the body’s daily rhythms to environmental light. Blocking the activity of these neurons reduced the severity of shifts in daily rhythms. These findings suggest a potential mechanism by which the modern advent of light at night may have led to an increased prevalence of sleep disorders. This article has been republished from materials provided by SfN. Note: material may have been edited for length and content. For further information, please contact the cited source.